Blue-eyed Buddy Boy has a thick winter coat! And a blue knitted blanket just his size. And new accommodation in the former dairy barn. YES! Close to the wood burning stove! The mower barn was drafty! And the hay barn is not the same since it was rebuilt after the fire in July. I introduced Buddy Boy in July, when he was found after being missing 21 days following a barn fire. He is well. Though he may prefer rolls of hay in the winter, presently he resides in the mower barn. Found 21 days after the hay barn fire! Buddy Boy is well on his way to recovery. in an ordinary stream on an ordinary farm. Begin at the rusty barbed wire fence in the northeast section. Emerge at the one land bridge. My exercises of choice include 5K walking, yoga classes and swimming laps. I wrote a post about the Automattic’s Worldwide 5K Event September 23rd last year. I’m looking forward to doing another one this year. 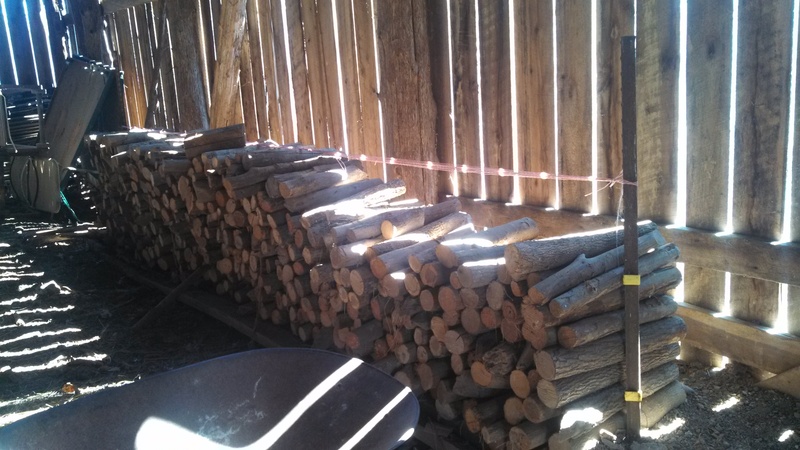 Opportunities to stretch oneself come along….like relocating firewood to help open space in a barn for more hay storage. 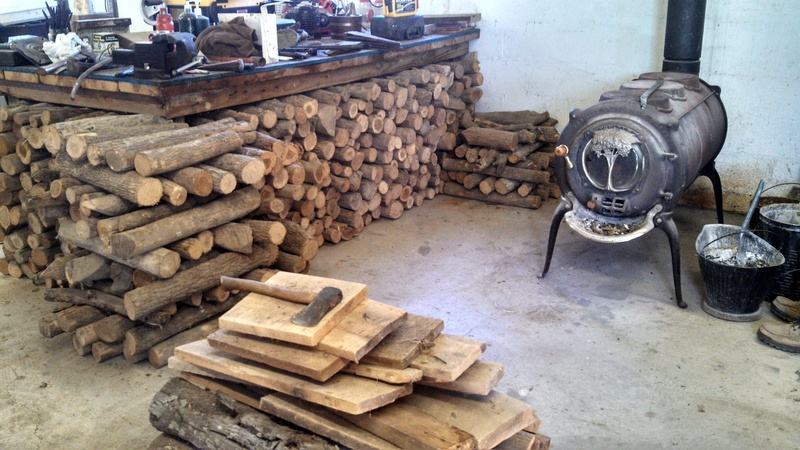 The subject firewood was very neatly stacked at the point where it was cut. 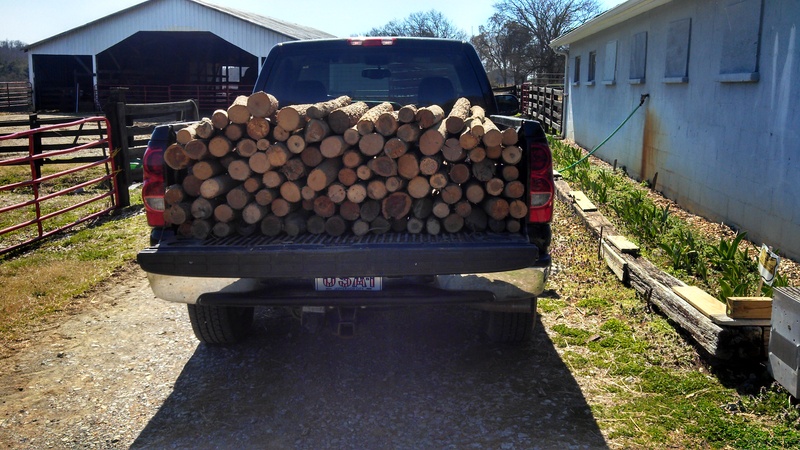 This stack was originally small, long, straight trees used for poles to hang tobacco plants to dry. (The hay barn was originally a tobacco barn.) 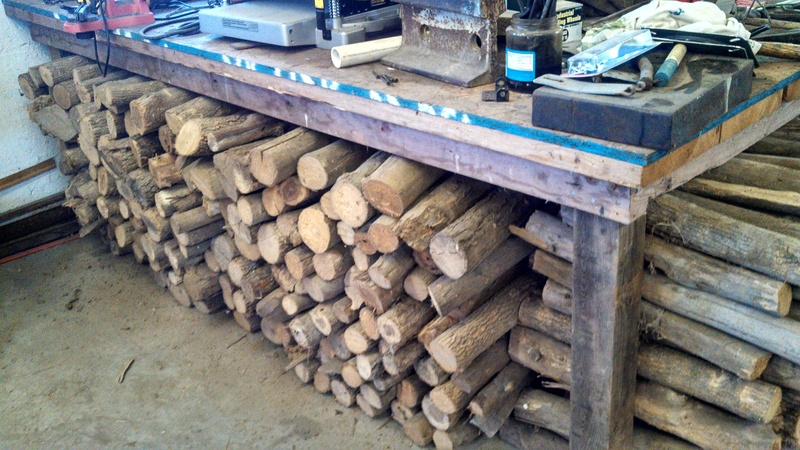 Long out of use, the poles were cut into firewood. The problem is this is about a quarter-mile from where it would ultimately be used. Now, this is where my alternative workout comes in. 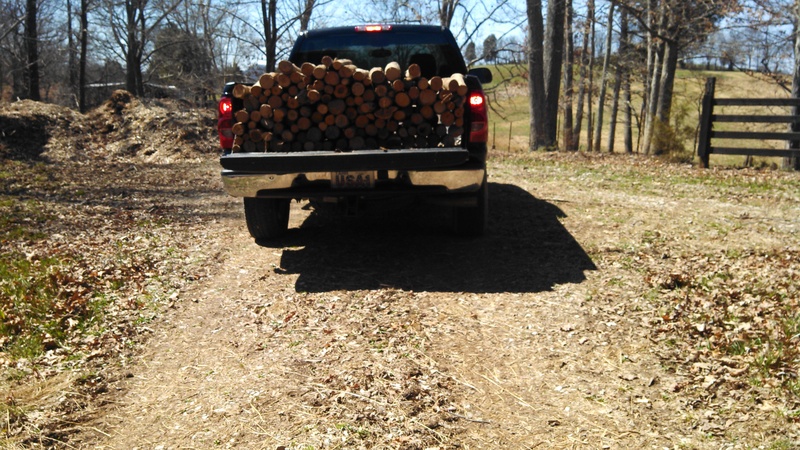 My estimation is there were 45 wheel barrel loads times two with about 66# per load. First to load the end of the truck at the hay barn and the second to unload at the former dairy barn. This is one row deep on the truck with the goal to stay within an ergonomic zone for reach (which did not apply to the start and finish stacks). So, where am I going with this? 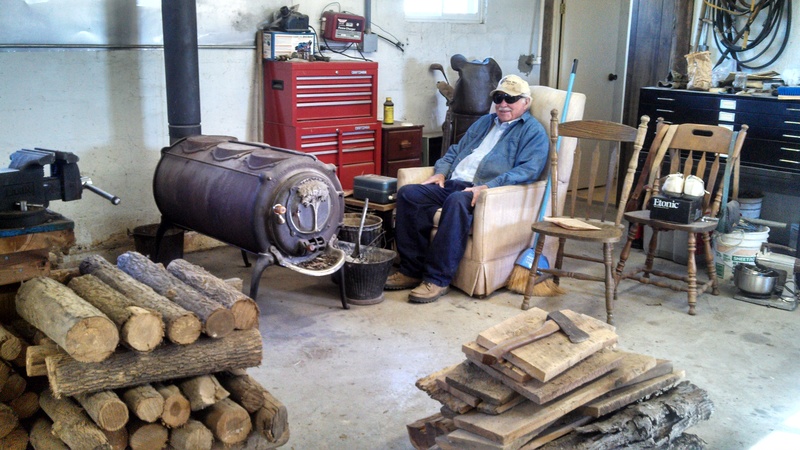 Dad is ready for next winter with wood at point of use, stowed under a 4′ x 8′ workbench. Yes, there was an overflow. 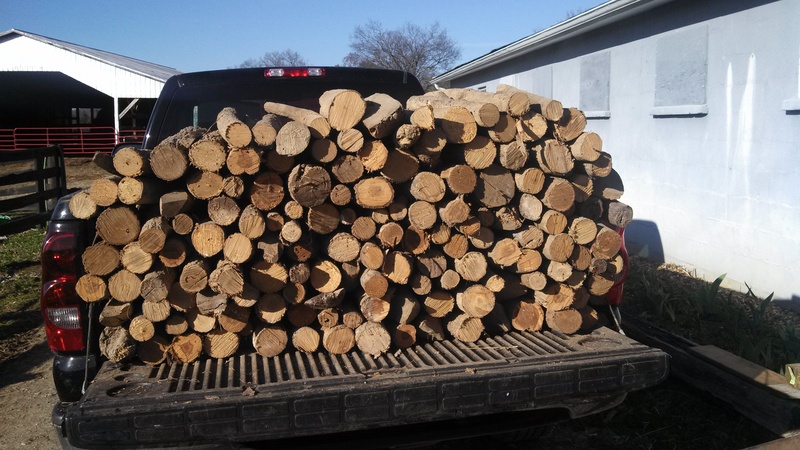 Fun estimates: density of this wood=30#/cu.ft and 100 cu. ft of storage makes for 3000#s or 1.5 tons! That concludes the story of my alternative workout.